It's inevitable that nine out of 10 startups will fail within their first year. Many potential entrepreneurs fear starting a business, as the risk of failing is so high. The statistics are so surreal, it makes you lose confidence in yourself and your ideas. It’s no wonder why so many individuals become serial entrepreneurs who hope just one of their various ideas will prevail. Every successful company initially started with insignificant resources. Consider the legendary story of the foundation of Apple: Two entrepreneurs worked in a garage with only $1,000 in capital. Where is Apple today? A multibillion-dollar company! Today, Millennials are filled with the entrepreneurial spirit to start new companies. Markets are becoming saturated and new industries are emerging. Will you stand a chance? Are you breaking the cardinal rules of running a successful company? Success is such a vague term, with endless clichés and quotes that describe it; it’s hard to measure. Experts say it takes self-reliance and perseveration to succeed, but it is a combination of great decisions. 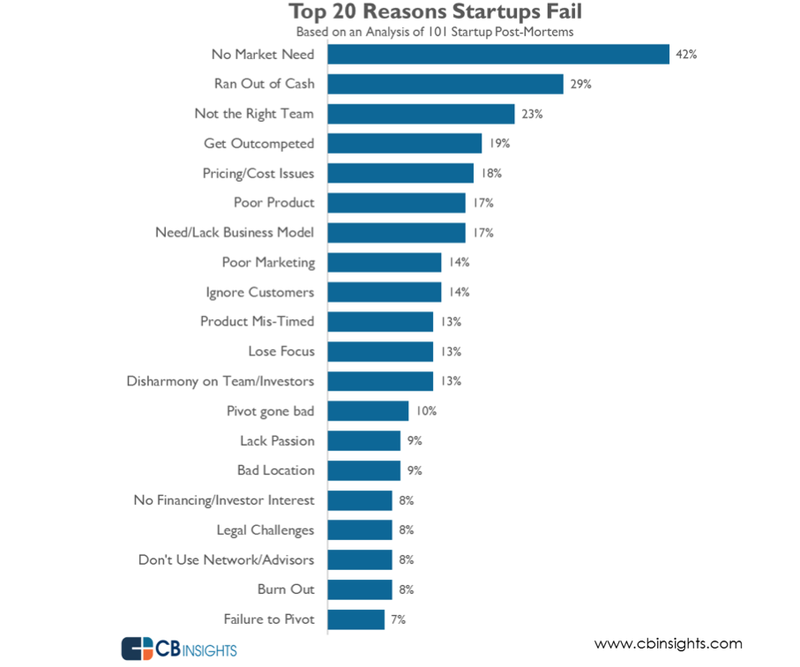 According to CBSInsights, 42 percent of startup failure is due to no market need. There is nearly a substitute for each product in each industry. What makes your product or service so special? You’ve come up with a great idea, but it isn’t selling. You failed to do extensive market research, and there is no demand for your product or service. It happens. You aren’t able to make a thorough market analysis. Many startups don’t have the capital resources to put together fancy focus groups or gifts to offer for filled surveys. Your product is great; the customer base is there, but the unique selling proposition isn’t compelling customers to buy. What makes your product different? What’s your competitive advantage? Having a competitive advantage strategy is vital when operating in any market. If you can’t afford formal market research, do it virtually. Test your product or service before launching. Don’t let your fear of imitators stop you. Testing your product or service beforehand can save you a lot of time and money and you’ll have the advantage to correct or adjust any prospective issues with your product or service. You've raised the sufficient capital to fund your startup, but you failed to allocate those resources evenly. You eventually run out of funds. As a result, you can't continue to run your startup because ongoing cost has exceeded and you're unable to pay. You failed to budget carefully and didn’t strategize on how long it would take to break even or reach positive funding or revenue. You’ve hired too many people, and your costs have increased as money is being consumed at an exponential level. Create a thorough budget plan and be sure to follow-up with your plan. Try to keep costs to a minimum while still adding maximum value. For employees, compensate them with equity instead of money. If you want to save as much as possible, hire knowledgeable interns. You hired the wrong team; you can’t get along with your cofounder or employee(s). You hired people who don’t take their work seriously and aren’t obsessive with their work. The management team isn’t powerful and isn’t committed to working long, hard hours. They are your friends who don’t take you very seriously and don’t want to invest their energy in making your startup thrive. Before hiring people, assess their skills and competency. Be sure to hire someone who takes his or her work seriously to an almost obsessive degree. Evaluate his or her knowledge, performance and credibility. Find individuals who are compatible with you and the rest of the members on your team. And most importantly, hire people who aren’t afraid to voice their opinions and have different perspectives. If your main objective is to produce more quantity than quality within your product and/or services, you will lose the opportunity to capture value as you're too heavily focused on "how much" rather than value. You devote time focusing on the number of social media platforms you should use to promote your product or service rather than on the centric message while using only one or two platforms. Build exclusivity in your brand image by limiting distribution and/or staying within major cities. This will be perceived as high quality and will encourage curiosity from potential consumers. Rather than investing energy in updating every social media platform, spend time investing in one where you can build an audience with which to communicate. You fail to introduce new ideas and notions to your startup and your customers have become jaded from your products or services. You tend to follow the same systematic approach toward reaching new customers or product development. You fear your curiosity and novelty will result to an unresponsive market. Awaken your innovator's DNA and try something different. Question yourself and your work and envision prospective ideas. Try incorporating concepts from another industry into your own and build on your creativity. In retrospect, it is important to be consistent, but it’s also imperative to be innovative along the way. Startups are becoming more populous, and many of them don’t stand a chance. You have the potential to defy these reasons and succeed, but do you have what it takes?